SCVHistory.com LW2804 | Saugus | Halafax Explosives Co. Advertisement (Pre-Bermite), May 1935. This advertisement appeared in the May 1935 edition of Engineering and Mining Journal just as Halafax (named for its financier, Erle P. Halliburton) was opening its explosives manufacturing plant in Saugus. At the time, the mining industry was a primary consumer of blasting powders. Competition was fierce among manufacturers who tried to produce a stable and effective product: one that performed consistently and which exploded when it was supposed to — and not when it wasn't supposed to. 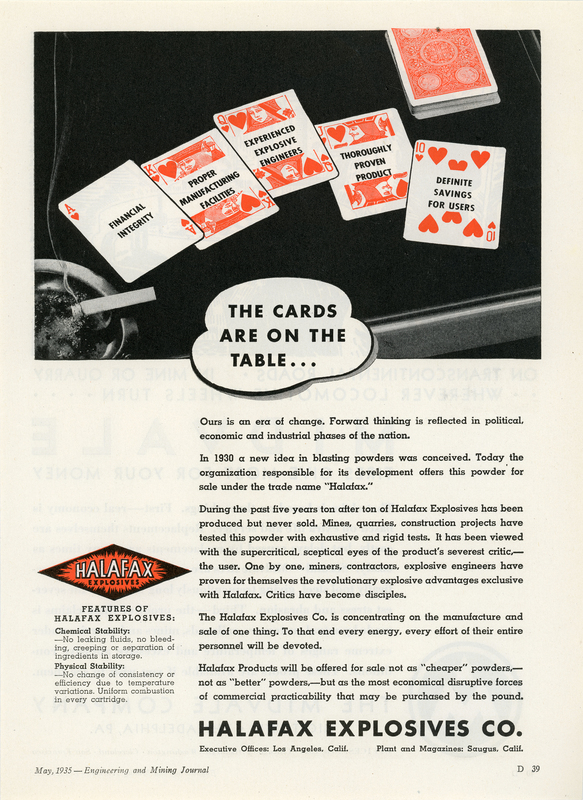 Halafax went bankrupt and was acquired in 1942 by Bermite Powder Co., which was already manfacturing fireworks on adjacent property. Bermite continued to make fireworks and munitions on on its 996-acre property until 1987 when it was forced to shut down (then as a division of Whittaker Corp.), leaving behind dozens of toxic and hazardous materials. Ours is an era of change. Forward thinking is reflected in political, economic and industrial phases of the nation. In 1930 a new idea in blasing powders was conceived. Today the organization responsible for its development offers this powder for sale under the trade name "Halafax." During the past five years ton after ton of Halafax Explosives has been produced but never sold. Mines, quarries, construction projects have tested this powder with exhaustive and rigid tests. It has been viewed with the supercritical, sceptical [sic] eyes of the product's severest critic — the user. One by one, miners, contractors, explosive engineers have proven for themselves the revolutionary explosive advantages exlusive with Halafax. Critics have become disciples. The Halafax Explosives Co. is concentrating on the manufacture and sale of one thing. To that end every energy, every effort of their entire personnel will be devoted. Halafax Products will be offered for sale not as "cheaper" powders, — not as "better" powders, — but as the most economical disruptive forces of commercial practicability that may be purchased by the pound. Chemical Stability: No leaking fluids, no bleeding, creeping or separation of ingredients in storage. Physical Stability: No change of consistency or efficiency due to temperature variations. Uniform combustion in every cartridge. Executive Offices: Los Angeles, Calif.
Plant and Magazines: Saugus, Calif.
LW2804: 9600 dpi jpeg from original 8x11-inch magazine page purchased 2015 by Leon Worden.